Psychedelic groove jazz? Post-rock meets chamber pop? All of those elements are here, but the end result isn't nearly as daft as the genre-speak makes it seem. The whole of Stirrup's sound gels quite naturally, so you don't need to fear that this may be an overly self-conscious experiment in style-hopping. In fact, I believe the opposite may be true. The trio is so open in its approach that it allows for a wide range of influences and sounds to flow into the music they create. The disc opens with Nick Macri (bass) and Charles Rumback (drums) providing the sturdy pavement that Fred Lonberg-Holm pedals his electric cello (or guitar) across. This is the basic sound of the group, I suppose – but it doesn't begin to describe what they set out to do with this recipe. 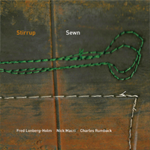 Gorgeous exotic melodies from Lonberg-Holm's guitar on “The Profit of Field Stripping” are reminiscent of Ask The Ages-era Sonny Sharrock. He also does the hippie noodling pretty well, as on “Insen for Yonsei,” where he channels Santana. But don't fear the tie-dye as it comes tinged with exercises like “Song for Salim,” a long uptempo groove that sounds like the Contortions covering “On the Corner”. Macri and Rumback are an ace rhythm section, solidly holding down the ship throughout every type of twist and turn, as on “Convulsive,” a slow, long meditative track that is the highlight of the recording. Jazz raga? Rosaly's name crops up on a ton of recordings on Chicago-based bands, but I believe this is the first one that features him as a bandleader. 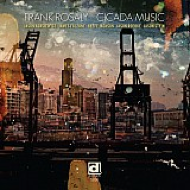 His solo recordings have revealed a deep interest in sonic texture, so it's not surprising that he has chosen a unique lineup for Cicada Music: three clarinetists (Keefe Jackson, Jason Stein, James Falzone), vibes (Jason Adasiewicz), bass (Jason Roebke) and percussion (Rosaly). It opens with a short piece featuring Rosaly (on drums and electronics) and Adasiewicz, before the bass clarinet bullfrog honk of “Wet Feet Splashing” yanks you toward a cartoon lake full of ducks and freshwater fish set beneath shimmering stars. (Fellow Chicagoan Lilli Carre would be the perfect video director for this band.) This is followed by the slow and dreamlike “Babies,” with its beautiful harmonic structure and sublime clarinet solo. Clarinets belch and wheeze their way through the brief “Yards,” while Roebke plays the cracklebox over Rosaly's solid foundation. “Tragically Positive” serves as a fine example of how well these players work together. According to Rosaly's website, the band was conceived five years ago – which is plenty of time to develop the telepathic interplay on display here. They're like a stone-faced version of MOPDTK. It's also impossible to avoid thoughts of the “Out to Lunch” Dolphy/Hutcherson axis when listening to this band; but it seems the possibilities of the vibes/reeds combination have not been fully explored – as proven throughout this disc. The real standout track here is “Typophile/Apples,” which opens with a cacophony worthy of Brotzmann. The three reeds go ballistic while Rosaly and Adasiewicz lay out an impressionistic base underneath. The drums and vibes are joined by Roebke's bass on a groove dance that features a lone clarinet (Jackson?) playing exhilarating swirling lines. The piece is broken into various sections by melody lines played in unison. It's the centerpiece to this triumphant debut recording of Frank Rosaly as a composer and a bandleader. It's hard to hear the saxophone / upright bass combination and not think of film noir soundtracks; but send that off into a freer territory and it becomes a bit like a post-modern version of the genre. 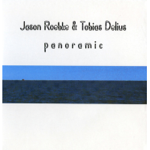 Roebke and Delius begin with the blues – and then point it directly at the night sky. Blues and the abstract moon. Their rapport is fascinating. There is a center to this music that each acknowledges in their playing (beyond the blues), but that neither directly references. It's as if they're both tethered to each other; and they're hashing out a plan of escape. This music is that dialogue, with all of the disagreements over the details and the handshake of an agreed-upon common goal. Highlights include “No Light,” where Roebke's bowing and Delius' long Arthur Doyle-type lines come together to create an atmosphere of a sweaty, oppressive, humid afternoon – and the meditative-but-playful “Punkin,” where Delius' habit of following up a particularly long note followed by a series of quick runs is matched by Roebke's whip-smart replies, which seem to catch up and begin writing hopscotch patterns onto the floor before Delius can jump into them. It's an amazing game of tag where you can't tell who is the hunter and who is the prey. Welcome to the sound world of Keefe Jackson's all-reed ensemble. The entire saxophone family is represented here, as is the majority of the clarinet clan. There are six musicians in addition to Jackson (Mars Williams, Wacław Zimpel, Marc Stucki, Dave Rempis, Peter A. Schmid, and Thomas K.J. Mejer) and the music they play is cerebral and concise, with plenty of room for the individual players to communicate their own ideas within the framework of Jackson's compositions. Think pop-song Braxton. 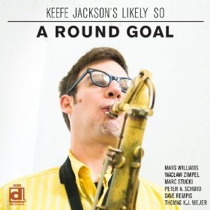 As for the compositions, Jackson really came into his own around the time of Seeing You See, his phenomenal Ornette-fueled Clean Feed quartet disc from 2010. His writing seemed to take a u-turn away from his modus operandi as a player. While his solos generally pulled apart whatever music he played and attempted to reconstruct it in interesting ways, his writing began to take on a constructionist approach, calculated from the ground up. When this is applied to the all-reed conglomeration, with Jackson understanding the textures of these instruments above all other combinations, it has the potential to become an architectural masterpiece. With this band executing the blueprint plans, that's exactly what it becomes. This is the most difficult of his many projects; but it is also the most rewarding listen. The chord structures and, especially, the textures of this music are thrilling in ways I never would have expected from music that is not percussion driven. The harmonic structure of some of these pieces are so incredible I have to wonder what Monk disciple Steve Lacy would've made of this. It's difficult to discuss the individual pieces, as they all seem to belong to the whole – and the synchronicity these guys achieve in executing them is nothing short of terrifying. A few details (without the aid of liner notes): Rempis takes a solo on “Bridge Solo” that consists of rhythmic chugging based around a few notes and considerable harmonics. Marc Stucki drones a harmonium note on “Neither Spin Nor Weave” so a keyboard reed instrument is also represented. Mars Williams (I think) blows an impressive soprano solo at the beginning of “Roses” - full of overtones and grace notes – as other players appear underneath droning in unison. A melodic pattern follows, then Monk-like accidentals and chords that spiral and warp, pushing it over the top. Intoxicating. And whoever the soloists are on the title track... holy mother of crap! This album was recorded in front of a very lucky live audience in Berne, Switzerland. Highest recommendation. That's a very well written and informative set of reviews. So much music, so little time. I will thanks YOU and the whole FREEJAZZ Collective for Your generosity and hard work. No doub this is one of the best musical places on the web! A clarification. this is not Frank Rosaly's first album as a leader but almost the second I've found a few days ago a marvellous album under F R name titled Viscous. That's a 2008 recording recently issued. Thanks Colin and LYM! We will be reviewing Rosaly's Viscous soon.